The purpose of an ankle replacement is to relieve pain from ankle arthritis while still allowing the ankle to move. Multiple types of arthritis commonly affect the ankle including osteoarthritis, post-traumatic arthritis, and rheumatoid arthritis. Ankle replacement consists of resurfacing the joint including the tibia (shin bone) and the talus (ankle bone) with a metal alloy, and then placing a plastic spacer in between the metal components to act as a bearing allowing motion. When an ankle is fused, the damaged cartilage is removed and the tibia bone and talus bone heal together with bridging bone, thereby eliminating the ankle joint. This results in good pain relief, but also results in a loss of motion at the ankle joint. When an ankle is replaced, the damaged articular cartilage is removed and replaced with metal alloy (CoCr) and plastic (polyethylene) components. These implants replace the painful joint surface and are designed to maintain joint motion. By maintaining ankle motion, there is less stress on the surrounding joints, which may slow degeneration of these joints when compared to an ankle fusion. The ability to move the ankle may also be important for maintaining a normal walking pattern, especially on uneven ground. Multiple studies have demonstrated that the results of ankle replacement are very gratifying. The functional results regarding walking, standing, and pain control are reported to be equivalent to or better than ankle fusion. Familiarity with the ankle replacement procedure has led to more accurate implantation of the implants and a reduction in complication rates. Appropriate balancing of the foot during ankle replacement surgery will also provide improved longevity to the ankle implant. While these guidelines are not set in stone, they are important considerations when evaluating the candidacy of a patient for an ankle replacement. 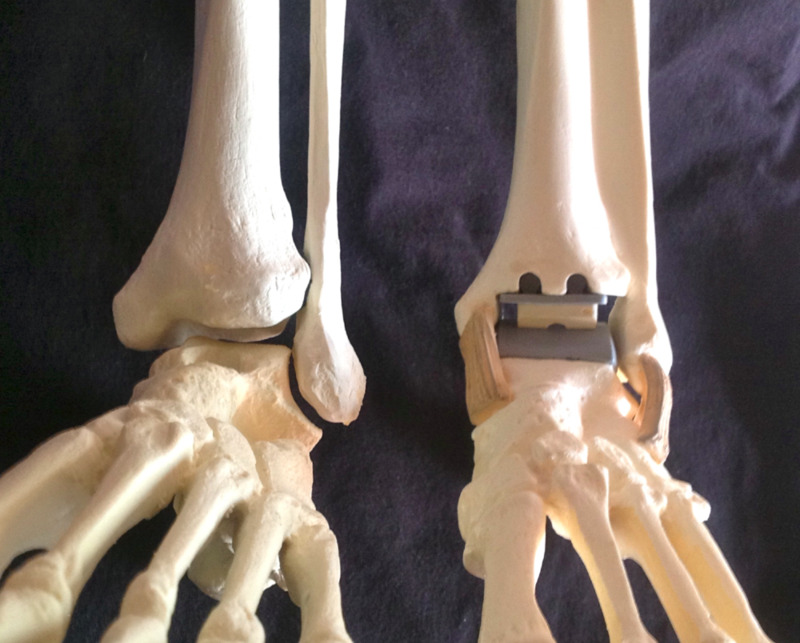 the ankle joint on the left and a model with a total ankle replacement on the right. Ankle replacement is performed in an operative suite with an anesthesia team and an orthopedic surgery team. Many patients prefer to have a nerve block placed in the leg to help with postoperative pain control. Sometimes additional procedures are performed simultaneously with total ankle replacement, such as removing previously placed hardware, lengthening a tight Achilles' tendon, or balancing the foot. Depending upon your age, medical conditions, how far you have traveled, and other factors, you will likely stay in the hospital one or two nights. You will receive individualized care on the floor from our highly skilled nurses. An orthopedic associate will see you each day. A physical therapist will assist you in safely walking with crutches, a walker, or a rolling knee scooter without putting weight on your new ankle. Much of the time immediately after surgery is spent resting and elevating your leg to decrease swelling. It is generally recommended that you keep your leg elevated as much as possible during the first week. You will be discharged from the hospital on post-operative day 1 or 2 with a prescription for pain medicine as the nerve block will eventually wear off. We request that you not put weight on your new ankle during the first few weeks after surgery, and you may need crutches, a walker, or a rolling knee scooter to aid with mobilization. The ankle is usually immobilized for 3-6 weeks to promote skin healing and most patients are able to begin putting weight on the ankle around that time. A post-operative walking boot is also utilized for a period of time as range of motion exercises are commenced. If additional procedures are required, they may alter the length of recovery time necessary. Below are links to patient testimonials, and also more detailed information on ankle replacement. We hope you find these resources informative.